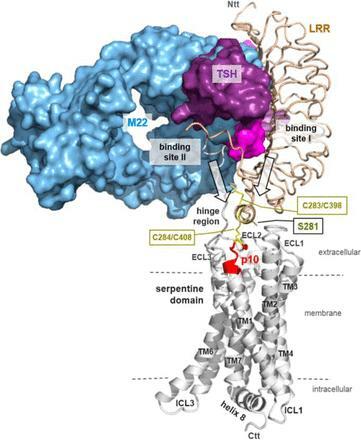 IMAGE: Model of a glycoprotein hormone receptor (white backbone ribbon) with bound hormone and the activating antibody visualizes a potential arrangement and the principle mechanism of glycoprotein hormone receptor activation. BETHESDA, Md., Jan. 8, 2016 — Thyroid disease affects about 12 percent of the U.S. population. While many people with thyroid disease don't even know they have it, an overactive or underactive thyroid can cause a slew of problems, including weight gain or loss, mood changes and infertility. In children, an underactive thyroid can be fatal, which is why they are tested for a deficiency at birth. Despite the prevalence of thyroid disease and its sometimes serious effects, researchers have struggled to answer a pretty basic question about the hormone-producing gland: What turns it on? A study published in this week's issue of the Journal of Biological Chemistry provides an answer, and that answer was found within the gland itself. What's more, the researchers who made the discovery say their finding will aid in the design of therapies for thyroid problems, such as Graves' disease, and problems with other glands that operate in a similar fashion. The thyroid gland is a hormone factory. Under normal conditions, the factory foreman — the molecule calling the shots — is the aptly named thyroid-stimulating hormone. Called TSH for short, this hormone attaches to a receptor on the thyroid cell surface, triggering a series of signals that provoke the gland to pump out thyroid hormones. However, sometimes autoantibodies, essentially posing as TSH, attach to the receptor and trick the thyroid into flooding the body with more hormones than are needed. In addition, sometimes the receptor itself has an inherited or acquired mutation that triggers production of too many or too few hormones. Torsten Schöneberg of the University of Leipzig in Germany, who led the study reported in the JBC, says it was curious that the legitimate activator hormone, autoantibodies and mutations all were able to provoke thyroid hormone production. So his team set out to identify a common thread among them. Turns out, the answer lay in the receptor itself. "We discovered a small amino acid sequence – we call it p10 because it is 10 amino acids long — within the TSH receptor protein," Schöneberg explains. This sequence "functions as activator of the receptor upon binding of the hormone or autoantibodies." In other words, the receptor itself flips the switch — when it should and when it shouldn't. "In most other hormone-receptor systems, the hormone directly activates the receptor protein," says Antje Brüser, first author of the study and junior scientist of the group, offering the example of how adrenalin activates the ß adrenergic receptor. "In the case of glycoprotein hormone receptors, the family of proteins that includes the thyroid receptor, upon binding of the extracellular hormone, the intramolecular activator (p10) induces structural changes of the receptor protein, triggering activation of the intracellular signaling cascade." Now that researchers know from their cell studies that this family of receptors can essentially flip its own switch, they can use that information to design drugs to prevent that from happening when it shouldn't. "For example, in Graves' disease, autoantibodies directed against the TSH receptor stimulate the thyroid in an uncontrolled fashion, causing hyperthyroidism," Schöneberg says. "Our findings will promote the development of specific small-molecule drugs useful to treat Graves' disease and other dysfunctions of GPHRs." Read the open-access version of the paper by Schöneberg's team: http://www.jbc.org/content/early/2015/11/20/jbc.M115.701102.full.pdf+html. Read a short summary of the article: http://www.jbc.org/content/291/2/521. Read a profile of the first author of the paper, Antje Brüser: http://www.jbc.org/content/291/2/508/suppl/DCAuthor_profile.